Four books to give away: You have a chance to win a mystery adventure ebook by Linda Weaver Clarke. To enter to win, leave a comment with your preferred title. You can gain extra entries by sharing this giveaway on Facebook, Twitter, Google+, StumbleUpon, Tumblr and/or on a forum. Open worldwide. Linda Weaver Clarke will pick a winner on December 20. Check the comment section to see who has won. These all sound cool! They sound a bit like the Uncharted video game series, which definitely makes me want to read them! The Anasazi Intrigue sounds like a wonderful book! One that I would enjoy for sure! Thanks for the chance! Maybe a stupid question, but what does Anasazi mean? And Montezuma? Are they people or is it something you made up? Anasazi Intrigue: The Adventures of John and Julia Evans sounds good! What is your email, Rachelle? I need it to email you the ebook info. I would love to read Anasazi Intrigue. I'd love to enter! Mayan Intrigue. I love mystery adventure novels! I remember reading (and loving!) these books as a kid. I'd love to introduce my son to them. I think he'd really enjoy the Mayan Intrigue. Thank you for the videos. The Mayan Intrigue sounds intriguing! I love Mystery and Adventure!I like the video of Desert Intrigue! They all sound good though! I would love any of them. If I had to pick just one, I'd probably go with the Mayan Intrigue, just because I've visited the ruins and am fascinated with the history. Thanks! I have 2 of them (I think the first and 4th). I would love to win one of the other ones. I love adventure series! I would love the Mayan Intrigue book! Thanks, Vanessa, for having me on your blog. To answer a few questions... The Anasazi Indians are ancient Americans who lived here and left their mark, such as the petroglyphs carved into rock and villages made of cement that still stand today. Montezuma was an Aztec Indian and the leader of his people. It is said that he hid a great treasure estimated at around $10,000,000 worth of gold and jewels. The Mayan Indians live in Mexico and have lived here for centuries. These books are adventures and a mystery which have to do with these subjects. They were so much fun to write. I already have these books, but I wanted to stop by and offer Linda my support. Hope this series does well. I would choose Anasazi Intrigue sounds interesting and exciting. The Mayan Intrigue for me. All of these sound amazing - it would be hard to pick one, but I guess I would start with their first adventure. I'm sure I will be reading them all! 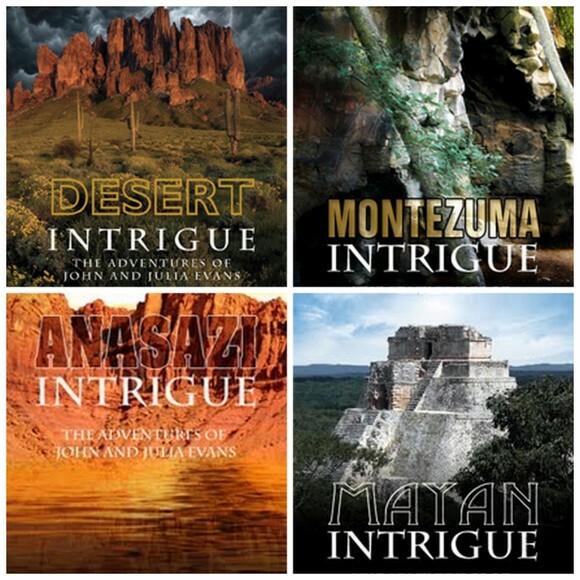 I really want to get my hands on a copy of The Anasazi Intrigue!!! Hope I strike lucky!! :D Thanks for the giveaways!! I have read Desert Intrigue and loved it. Linda is a gifted writer. I would love to read Montezuma Intrigue. I think Mayan Intrigue looks most interesting. Mayan intrigue looks like it would be an amazing read!!! Mayan Intrigue would interest me most. I'm very interested in the Mayan Intrigue. They all look great though. Montezuma Intrigue :) They all look interesting!! Thank you! I have ten winners for my ebooks. The winners are Nancy, Rachelle Anderson, Charlotte, Maria, Bonnie, Jenny, Nichole, Shayna, Em, and Kimberly. I will email each of you. I do need Rachelle Anderson's email, though. It wasn't listed.